1. The plan includes the marathon entry. 2. 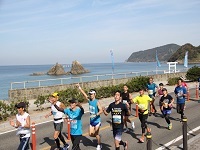 As you step out of the first floor of your hotel you will be right at the start point of the Fukuoka Marathon! 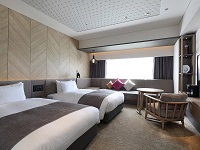 The plan includes a one-night stay at Solaria Nishitetsu Hotel Fukuoka in a great location! 3. This great plan includes the following special services that will no doubt make you happy! At the hotel and the finish point there will be a designated concierge desk for you around the clock to help you enjoy your stay. There will be English- and Chinese-speaking staff to help you! 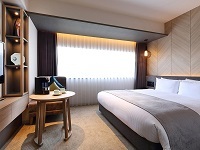 With this plan only, you can go through all the required race procedures at the concierge desk of Solaria Nishitetsu Hotel Fukuoka without going to the EXPO venue, including receiving your Number Card. ● When you depart from hotel in the morning, you can leave your stuffs you need after the race at the hotel. Please leave your stuffs at the hotel by the designated Fukuoka Marathon Bag. It will be returned at the degignated lounge at the finish point. The starting blocks are assigned by time forecast, but you can start from one of the front blocks if you make a request, nearer to the hotel. After the marathon, relax freely in the designated lounge to recuperate. Before returning to your hotel you can have a break in the designated lounge. You can also use the shower room. You can also jump the queue.Use the shuttle bus from the finish point to Tenjin (to return to your hotel) or Hakata Station easily. You will be put at the front of the queue so there is no need to line up. ● You can get optional plan information (like sightseeing and experience) after the middle of Augest!! ●Entrants of inbound entry are able to perticipate without lottely, however the application is accepted by first come, first served who have completed the application. Please be advised that it is not able to complete the application if it is fully booked. ●Japanese nationality is not accepted on this entry website. Please apply on Japanese website. 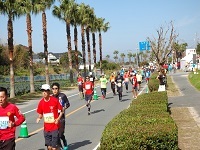 ●Because it is treated the same and apply outside the country, full marathon entry fee will be 15000 yen. Full marathon is only event you can apply from here. ●Overseas entry is accept only an individual entry. It is not accept group entry including family or friends. 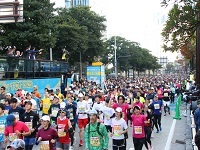 Each applicants need a JSS ID to apply Fukuoka Marathon. ●Entry Qualifications: Non-Japanese living outside of Japan. ●You can choice only single room when you apply the entry a person. You can choice only twin room when you apply the entry 2 people. ●Plan package＝ Marathon entry fee（full: 15,000 yen）and tour fee(hotel fee for Saturday, Nov 9, one night). ●If you want to stay extend, please make inquiries. ●The plan will be closed once maximum capacity has been reached and uses the first-come first-served basis. ●We do not accept separate marathon entries and hotel stays. ●Once you have signed up for the entry make sure to proceed to booking the hotel. ●Please note that we will not refund entry fees once paid. ●For tour cancellation fees(hotel cancelletion fees), see below. *We wil announce more details later. （JASPO standards) ※Entrants who fail to specify a T-shirt size in their application will be assigned an S size if female and M size if male. 4.If you have a lifestyle disease, consult to your physicians.